Quinoa is high in protein and is a good source of Magnesium. 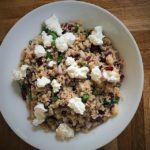 The combination of flavours in this salad make for a fresh tasting dish that is fab with fish, or just on its own! If you have cooked quinoa before and it has been a bit sloppy try toasting lightly first and use the 1:1 ratio of grains to water as I have here. Quinoa, Goats Cheese and Pomegranate Salad. GF. Wash the quinoa thoroughly in cold water, drain and toast lightly in a dry frying pan until the liquid evaporates. This makes sure you get a nice fluffy quinoa. Once done pop it in a saucepan with 200ml water, a squeeze of lemon juice, pinch of salt and a drop of olive oil. Bring to the boil over a medium heat. Once boiling, turn down the heat to a simmer, place the green beans in a sieve, sit the sieve on top of the pan and pop a lid or a plate over the top to allow the beans to steam. Cook and steam for 7 minutes. After 7 minutes remove the sieve with the beans in, run the beans under cold water and pop the top back on the pan and continue to cook the quinoa for a further 6 minutes before turning off. Give it a taste and if it needs a little longer just allow to steam a little with the lid on. Drain any remaining liquid from the quinoa and pop into a bowl, stir with a fork to fluff up. If serving straight away pop it in the freezer to cool down while you prep the veg and dressing. Pop the apple cider vinegar, olive oil, lemon juice and honey into a sealed plastic container and give it a good shake to mix well. Chop up the beans into centimeter chunks. Add the onion, beans, walnuts, pomegranate seeds to the quinoa and stir through so they are well mixed. Add a few twists of cracked black pepper and sea salt, and the dressing and mix through. Top with the crumbled goats cheese.